Clean water is essential to the health of a community. One of Kenya Connect’s first projects in 2002 was the installation of water tanks at partner schools. Many students were not attending school because they had to collect water for their families and had no water at school. 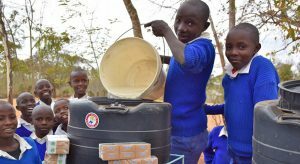 As a result, Kenya Connect embarked on an ambitious program to install water tanks at all 55 partner schools. We met our goal and are now installing additional tanks to ensure that there is enough water to drink and cook with at the schools. Our most recent tank was installed at Miondoni Secondary School thanks to a donation by students at Glenbard West High School, IL. With a high saline content in the water table, water tanks are the best choice to harvest water in Wamunyu. These 10,000 litre tanks will fill-up during a heavy rainfall and provide 3-6 months worth of water at the school. 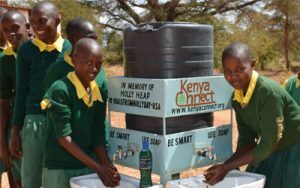 Most of students at Kenya Connect’s partner schools live in homesteads without running water and electricity. Some families have water tanks that harvest water during the rainy season, but most collect water at streams, ponds, and bore holes. Most of the water is not treated and that, coupled with the lack of hand washing, results in children with parasitic worms that compromise their immune system and make them more susceptible to other diseases. In 2011, Kenya Connect began deworming programs at three of our partner schools with the assistance of a visiting team and local health professionals. Since that date, with the support of St. John’s Episcopal Church, Thomas Wootton High School’s NHS, The Episcopal Diocese of Maryland, Johnson and Johnson Caring Crowd program and individual donors we are now deworming students at 28 of our 55 partner schools. Deworming in underdeveloped countries has been shown to be one of the most cost-effective means for keeping children healthy and in school. In addition to the deworming, which entails administering a pill to each child at 3 month intervals, 4 times a year, the medical doctor in Kenya provides hygiene information for the children and encourages them to use the installed hand washing stations (funded through Kenya Connect) and liquid soap to stay healthy. “If you’re healthy and you know it wash your hands!” Volunteers created a new song to the familiar tune of “If you’re happy and you know it…..” to teach and encourage students how to effectively wash their hands. Part of a larger strategy to keep students healthy and in-school, 74 hand washing stations have been installed at partner schools with several larger schools with multiple stations. These stations, built by local craftspeople, were funded by schools, churches, and individual donors. In a follow-up evaluation of the use of these stations, we learned that they were being underutilized due to the lack of soap. 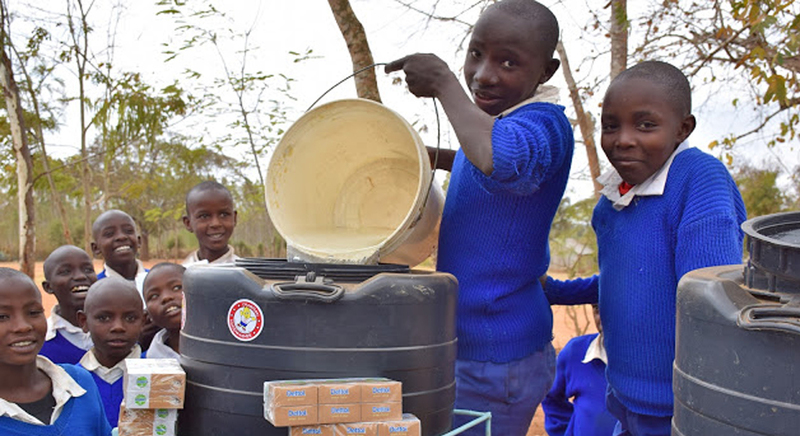 As a result, Kenya Connect sought solutions to develop a sustainable soap-making program. In 2017, we launched a liquid soap making program at all partner schools with newly created health clubs responsible for making the soap. These student groups make the liquid soap for their schools and then sell the excess to families for use at their homesteads. The profits are reinvested in making more soap and for special projects in their schools. Wings Poa, Kenya Connect’s Reusable Sanitary Pad program, is helping girls stay in school during their menstruation. An issue that had been raised by the Head Teachers, we began seeking a solution to help girls stay in school. One of our Board members worked to develop a prototype, and thanks to a grant by Kathy Wheeler, world Help and Caring Crowd, we launched the program with the purchase of three sewing machines, PUL fabric, and other supplies and women from the local Kithito Kya Kyeengai women’s group and students at the Wamunyu Special School creating the kits. When the kits are distributed, students and mothers are invited to learn more about menstrual health and hygiene and to learn about the new reusable kits from staff members and volunteers. We learned through surveying girls at two of our participating schools that 85% of the girls missed 3-4 days of school each month. After using the kits for 3 months, we learned that only 5% of the girls were missing school when they had their periods. We are thrilled with these initial results and have distributed 190 kits at 6 schools. 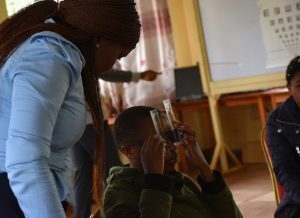 Kenya Connect also partnered with Afrocloud Technologies to create a Wings Poa digital curriculum that is being piloted with primary school students. We will continue to provide updates on this exciting program, but in the meantime, we invite you to watch a video to learn more about the Wings Poa kits! Many students suffer academically because they cannot clearly see the blackboard. Most classrooms are dimly lit which further exacerbates the issue and bright, eager children are often unable to fulfill their potential. As a result, Kenya Connect is partnering with Global Vision 2020, a NGO committed to providing low-cost eye screening and eye glasses through their innovative USee product. 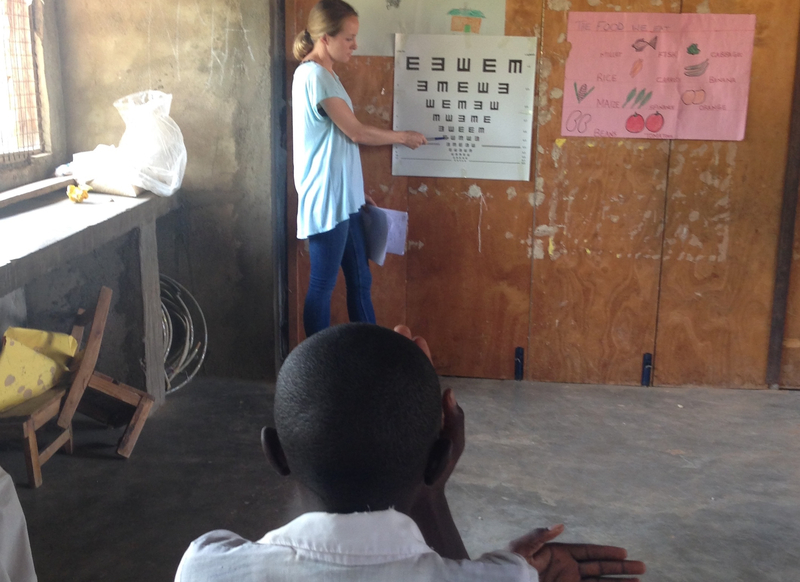 In addition to screening students, parents and teachers are also being screened for corrective glasses including “readers”.